I said it once, and I'll say it again. I like toys. A recent fascination has been the Munny and Dunny series put out by KidRobot. The simple DIY Vinyl toys are just so fun to own. But really I fear ever doing anything aside from making clothes (which won't damage the actual vinyl of the Munny) for my little guy. 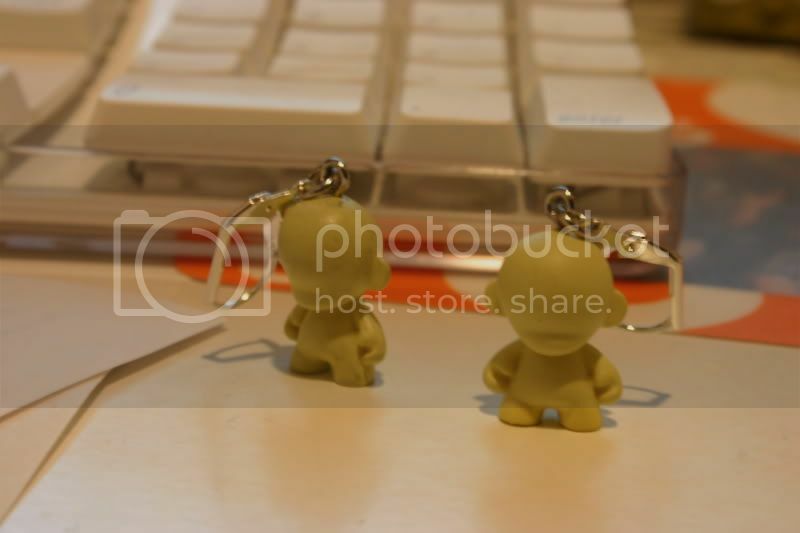 However recently I've been getting into the Munny Zipper pulls. They're made to be attached to zippers or used as key chains, but they have one major flaw. The clasp which they use to attach to things is far too small for many things. With a little creative brainstorming and unfortunate blind box assortment, I ended up creating a couple things out of these zipper pulls. There's a 1 in 25 chance to get a plain Munny with no accessory and just differing colors. Jenn got a green Munny with a fedora. How awesome is that? That's 2/25. I on my first try, got a yellow one. Not bad, not great. My second try maybe a month later, got another yellow Munny. What's the chances of that? That's insane and rather upsetting. Finally after my third try I got a black Munny and this is what I made out of the three. I can't seem to find my other camera in which Jenn's accessory was taken. Anyhow hope you enjoy it. A set of Munny earrings. And cellphone charm.